This is a magnificent failure, a classic case of Hollywood buying a novel for its strengths, and then lacking the guts to put those strengths on the screen. And it’s a damn shame, because it could have been great. Samuel Shellabarger’s best-selling 1945 novel tells the story of a naïve young Spanish nobleman who runs afoul of the Inquisition; to escape persecution and certain death, he joins Hernán Cortez’s expedition to Mexico, becoming one of the conquistador’s trusted officers. The novel pulls no punches in its depiction of the excesses of the Inquisition and the horrific events of the Conquest of Mexico, but the screenplay for the film chokes on both those points, soft-pedaling the Inquisition (and changing its name), and waffling on whether the slaughter and suppression of the Aztecs is deplorable or glorious. And that’s not even the worst of it. When a historical fiction author involves their protagonist in great historical events, it’s essential to make that protagonist a mover and driver of the action rather than a mere spectator. This is where the script for Captain from Castile fails in a big way, as Captain Pedro de Vargas is nearly always swept along by other forces rather than directing or influencing them himself. Poor Tyrone Power, who plays Vargas: much of the time he simply seems clueless or bewildered. The exceptions are when the story calls for some swashbuckling, briefly giving him some clear purpose, and when he’s romancing the fabulous Jean Peters as Catana, dazzling here in her début rôle. There’s genuine chemistry between Powers and Peters, especially in a white-hot scene at a Mexican campfire where they dance a blazing sarabanda. Vaya! This movie does have other things going for it as well. For one thing, it’s bloody gorgeous, shot in full color largely on location in Mexico at or near the actual sites of the Conquest. 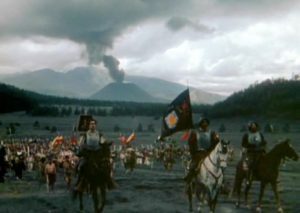 Historically, part of Cortez’s march on the Aztec capital took place against the backdrop of an active volcano, and while shooting this film the peak of Paricutín obligingly erupted, enabling jaw-dropping scenes of the Conquistadores marching across country with a great volcanic ash-cloud smeared across the sky behind them. Another visual home run: meticulous research went into re-creating the arms and clothing of the Aztecs, and they’re worn in the film by descendants of the Aztec people instead of Hollywood extras. Plus Cesar Romero gives an energetic performance as Cortez, alternating between inspiring leader and rapacious plunderer. And it’s all backed up by one of composer Alfred Newman’s greatest scores. Alas, ultimately the tonal inconsistency and the flaws in the story take the wind out of the sails of what should have been a masterpiece.